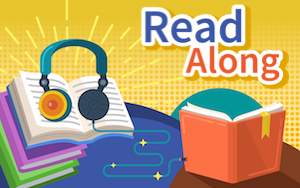 Introduces the new Read Along activity, which uses dialogic reading and self-reflection learning strategies. Read Along provides short ebook-style stories. Students can read or listen to each page and then answer page-specific prompts in an open-ended way. This develops comprehension (Stage 2 in our ALL progression). Students can also add their own annotations. Anything they write is saved to their digital portfolio, which their teacher(s) may access. Read Along works well as independent practice! Enhances the My Voice activity to enable lesson authors to enter sentences, short passages, or even poems that students may listen to, read aloud, and record. This winter we'll also add open-ended prompts to better support preparation for WIDA Access and other tests with speaking components. Speeds up activity loading. We trimmed and standardized the loading screens for quicker loading. You will also see some nice graphical changes coming this winter. Improves help for students. We've been working to make the left sidebar HELP button more consistent and useful for students, without interrupting practice. We've also improved instructional text and audio. Squashes bugs. For example, some game levels in Scrambled Sentences were getting mixed up. Also, sometimes text on the lesson cards was getting chopped off or hidden. Activity guides. We have a first set of activity guides developed (more on the way!) that provide the learning goals, strategies, and how-to information for each type of activity in Speak Agent.